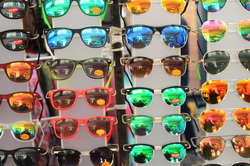 Summer months ahead and let us at Colonial Heights Vision Center show you today's hottest sunglasses. This years sunglasses are big, bold, and full of color. Are you tired of all that glare? ​Let us show you how polarized lenses can take all that glare away, and show you what you've been missing. Buy one complete pair (frame and lenses) and get a 2nd pair @ 50% off the frame & lenses. Not valid with other coupons, discounts, package offers, sale items, promotional offers, previous purchases, insurance programs, readers, or non-prescription sunglasses. Eye exam not included. Some restrictions may apply. See store for details. Buy a one year supply of contacts and get 25% off any ready to wear sunglass. Coupon must be presented at time of purchase. Not valid with other coupons, discounts, package offers, sale items, promotional offers, previous purchases, insurance programs. Eye exam not included. Some restrictions may apply. See store for details. Free Shipping when you get a years supply of contacts. Not valid with other coupons, discounts, package offers, sale items, promotional offers, previous purchases, insurance programs.